Remember when Robert Blake used to call young punks "mooks" on Baretta? Well, dis ain't dat kinda mook. And dat's da name of dat tune. MOOCs are Massive Open Online Courses, or college classes taught free online and usually not for credit (though that may change). The number of online college courses available and their quality gets better all the time. Here are the courses I've completed since retiring. The range of available subjects is amazing and the professors equal or exceed the quality I experienced in college and grad school. They're not all MOOCs. The classes at Boston University were not free (but they were excellent). All of the others were free. Udacity.com and Coursera.com are great places to start your search. It’s not uncommon to hear Americans complain about gasoline prices and, of course, older people complain more. That's because we are old enough to remember when the nominal price of gasoline was like, 29¢ a gallon, so $3.40 a gallon in 2013 seems outrageous. Nominal or real, gasoline prices per gallon are high today — they’re well above the real long-term average cost of about $2.00 a gallon since 1931. 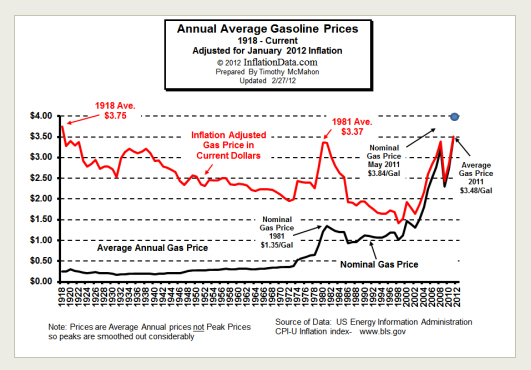 In this chart from InflationData.com, the red line shows the real price of a gallon of gas since 1931. We perceive that the price of gasoline is constantly rising (the black line) because we see inflated prices. 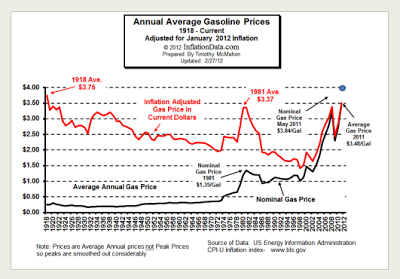 But, the real cost of gasoline per gallon is all over the place, highest in 1918 and 1981 and lowest in 1999. Let me explain the columns of this table by looking at the top row (click to make it larger). When I went to the University of Kentucky with several of my EHS classmates in 1970, I paid a whopping $165 per semester for tuition. This year, my alma mater’s tuition is $4,978 per semester. (But that includes basketball tickets, so it’s still a steal). That’s a nominal price increase of 2,917%, but a lot of that is not real — it’s the result of inflation. If I squeeze out the inflation portion by restating the 2012 price in 1970 dollars, I get $841 instead of $4,978. In other words, $841 in 1970 had the same purchasing power that $4,978 has today. So, the real increase in price is not 2,917%, but 410% (from $165 to $841). Still an awful lot, compared to 1970, for in-state tuition at a state university. As the table shows, health care and the cost of tuition at UK have increased far faster than the average American worker's income (row 3). Both the average cost of four years of college in the U.S. and the median home price (after the real estate crash) have increased a lot faster than general inflation but less than average incomes. Gasoline prices haven’t increased as fast as tuition, homes, health care or college, or as fast as average incomes, but they have outpaced general inflation. A minimum wage earner in 2013 earns $7.20 hourly and can buy 2.1 gallons at $3.40 per gallon with an hour of work (while having no one to say, "I'll have a dollar's worth" to). On the other hand, gas mileage for the U.S. auto fleet has improved from 13.75 mpg in 1970 to 32 mpg in 2013 (it took 3 gallons of gas just to start my '68 Chevelle SS 396). Looked at from that perspective, an hour of minimum wage labor in 1970 would have purchased an average of 61 miles driving a car that got 13.75 mpg. That same hour of minimum wage labor in 2013 would purchase 68 miles of driving at 32 mpg today. From a consumption perspective, the cost of gasoline per year has actually decreased a bit. We pay about twice as much for a gallon now in real dollars, but that gallon takes us about 2.3 times as far. We fare even better if we look at the average hourly pay rates for 1970 ($3.41) and 2012 ($19.97) instead of the minimum wage. For someone earning the average wage instead of minimum, an hour of labor in 1970 bought enough gas to travel 130 miles while an hour of labor in 2012 bought enough gas to travel 188 miles. For one last example from my youth, consider the drive home from UK in Lexington to Elizabethtown (still 85 miles after all these years) that my EHS buddies and I made many times. In 1970, that trip would have used about 6.18 gallons of gas at a cost of $2.23. Today, the trip would require 2.7 gallons at a cost of $9.18. But nine dollars in 2013 is only about a buck and a half in 1970 dollars and that's 31% cheaper. If I drove a Prius from school in Lexington to E-town today I would get 50 mpg and it would cost $0.92 for gas in 1970 dollars — less than half what it cost in 1970 — and many of my classmates would laugh at me for driving a hybrid. So, whether you consider minimum or average wage rates, while the cost of a gallon of gas has gone up, the cost of enough gas to travel each mile has gone down due to better vehicle gas mileage. Still, I'd love to have my '68 SS 396 back, even if I could only afford to drive it on Sundays. Just once, with the windows down in the spring and the 8-track blaring Grand Funk. But, I digress. . . Which brings us to line 9, the minimum wage. I worked construction one summer while I was in college for a buck sixty an hour. Hardest job I ever had. Today, a minimum wage job would pay $7.25, but in 1970 dollars, that’s only $1.23. Real minimum wages have actually fallen 23% in value since I was in college. A politician in our state recently asked why college kids take on so much debt today and wondered aloud why kids can’t just work their way through school like she did back in the 1970’s. Lines 4 and 9 answer her question. College prices have grown 85% for a four-year education while the wages for the kinds of jobs a college kid might get have actually fallen 23%. I paid my way through college. I had to work 103 hours at $1.60 per hour to pay for one semester of college tuition. A college student today would have to work 687 hours at $7.25 to pay for one semester of tuition at UK. And that’s just tuition. It doesn’t include books, room and board, or beer! If I subtract 5.5% FICA taxes for 1970 wages and 7.65% for 2013, that's actually 109 hours I needed to work in 1970 and 743 hours my kids would need to work in 2012. For every hour I had to work in 1970, they'd have to work nearly seven now. So, yeah, gas prices are high, but so are a lot of other things. While the price of a gallon of gas has risen since 1970, the cost of a "mile's worth" of gasoline has actually dropped. At least we have some personal control over gasoline expenses. My family bought a Prius last year and we cut our annual gasoline bill in half. With two kids in college and one in med school, I wish Toyota could build a hybrid to halve tuition costs.